Powers/Abilities: La Bandera possessed the mutant ability to inspire others to her cause, then to draw on the faith that others had in her to send strong power blasts through a staff that she carried. As faith in her diminished, she had less power to fire her blasts, and as she focused on her blasts, her power to inspire faith in others diminished, the two powers seemingly working against each other even as they complemented each other. The extent of la Bandera's powers is unknown. History: (Wolverine II#19 (fb)) - The girl that would become la Bandera was born in Cuba, where her father acted as an aide to Fidel Castro. Her father eventually decided to defect and took her with him to the United States. Losing purpose in the States, her father turned to drugs and died as a junkie. (Wolverine II#19 (fb)) - At some point, she discovered that she had the mutant power to inspire others to her cause, and to use the faith they had in her to fire powerful blasts from a staff. She became la Bandera and planned to fight against the local drug trade, which she considered as the source of her family's troubles. (Wolverine II#19 (fb)) - La Bandera acted as a local hero in Florida, using her power to inspire others to her cause, and developed a name for herself. She eventually decided to take the fight to the drugs' source, the country of Tierra Verde. (Wolverine II#19) - Hired by the Kingpin to kill la Bandera, Tiger Shark pursued her to Tierra Verde and battled her on the docks. She took some hits before inspiring some locals to join her cause and blasting Tiger Shark into the ocean. She assumed the villain dead and turned to celebrate before Wolverine approached and warned her the battle wasn't over. Tiger Shark burst through the dock and the locals fled, diminishing la Bandera's powers. Tiger Shark prepared to kill her before Wolverine attacked and shredded Tiger Shark's suit, spilling water out and causing Tiger Shark to flee into the ocean. Again ready for victory, la Bandera moved to kiss Wolverine, but he resisted and tried to teach her how dangerous her mutant power was. She refused to listen and went away to start a revolution, ignoring Wolverine's advice that her powers would hurt more people than they would help. La Bandera received information that Felix Caridad, president of Tierra Verde and leader of the drug trade, had political prisoners at a nearby hospital. La Bandera inspired many local men and groups to join her cause and they stormed the hospital. (Wolverine II#20) - La Bandera fought her way through the hospital with the locals and found the ward that was to contain the political prisoners empty. Geist approached her and revealed that it was a trap while Tiger Shark killed or knocked unconscious the locals that still remained with la Bandera. Having no source to strengthen herself, Tiger Shark prepared to kill her, but la Bandera agilely tossed him aside and made a run for it into a misty room, where she found Wolverine. When Tiger Shark attacked again, Wolverine sliced through the villain's costume and into his chest, then tossed the villain off the balcony. Wolverine was deafened, but he led la Bandera with him to free Roughhouse, a captive of Caridad's. They did so, and la Bandera turned a gun on Caridad and Sister Salvation (Caridad's wife), taking them hostage to secure their escape. As they passed the hostage political prisoners, including Enrique, la Bandera inspired them to act to free themselves. 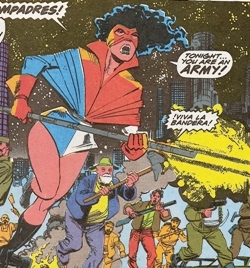 La Bandera, Wolverine, Roughhouse, Caridad, Sister Salvation, and some of the political prisoners boarded a helicopter to escape, and la Bandera used her powers to inspire confidence in the pilot. When Tiger Shark leapt at the helicopter, Wolverine knocked the villain into the water where Tiger Shark was attacked by a group of sharks. (Wolverine II#21 (fb)) - La Bandera and the political prisoners separated from the others and made their way through the jungles. (Wolverine II#21) - La Bandera noted that that Caridad's helicopters were pursuing Wolverine's group and not her. She resolved to inspire more to her cause and continue her war before coming across jungle savages. She presumably inspired them to her cause and renewed her war. (Captain America I#442 (fb)-BTS) - La Bandera, along with several other South American heroes, was stabbed to death by Zeitgeist. A picture was taken of her and left on her corpse. Comments: Created by Archie Goodwin, John Byrne, and Klaus Janson. Bandera is Spanish for flag. to any other "band" characters or anyone not mentioned in this profile. (Wolverine II#20) - Enrique was part of a group of political prisoners held by Geist and Felix Caridad in Tierra Verde. 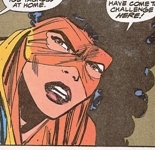 When la Bandera and Wolverine sought to escape with Roughhouse, and holding Caridad and Sister Salvation as hostages, the political prisoners were held as hostages as well. La Bandera used her powers to inspire the political prisoners to fight against their attackers before she escaped in a helicopter.